How to Get Tickets for a Movie Premier? Home > Ask Our Experts > How to Get Tickets for a Movie Premier? Do you have any tips on how you would go about getting tickets to a movie premiere and maybe being on the after show party list? Most movie fans dream of getting free premiere tickets to not only see a movie before everyone else, but also in the hope of catching a glimpse of one of their favourite movie stars. There are some tried and tested tips for increasing your chances of getting into a movie premiere and possibly even being on the after show party list. Location - One of the best tricks when it comes to getting tickets to a big movie event is to be in the right location. The majority of movie premieres take place in major cities like LA, New York or London. If you don't live in the vicinity of these types of big cities, consider looking out for charity premieres or film festival premieres, which often take place in smaller cities and are easier to get tickets to. They are often advertised in local newspapers or online. Planning - If you know there's an upcoming movie premiere that you're desperate to get into, always plan ahead and know exactly when it's taking place. Generally, if tickets are on sale to the public, they'll sell them early and within a limited time frame, so plan to be at the front of the queue when they're on sale. Contacts - The old saying "it's not what you know, it's who you know" is extremely pertinent with movie premieres. Many premieres are completely closed off from the public and the only way in is by knowing someone on the inside. This person may have worked on the movie, be working on the event, or simply work at the cinema where it's being held. Call in some favours and get a ticket from an insider where possible. This may be your only chance at a ticket to a premiere screening and is certainly one of the most common ways of getting into the after show party. Competitions - Many movie premiere tickets are given away by local radio stations in competitions. This serves to publicize the movie, as well as to fill the seats for little expense. Often your best chance of getting those elusive tickets will be to win them in a competition. Websites - You may see entertainment websites with tickets up for grabs also and the larger sites will generally have tickets to the after show party as well as goodie bags and other film related items. Enter as many competitions as you can and subscribe to as many websites as possible that generally offer these kinds of prizes to visitors. Work - If you're really committed, you can start your own film blog, delivering up to date movie news, reviews and more. This may help you get an invite to a premiere, or possibly will allow you to get a press pass if you're established enough. 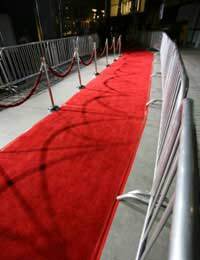 When it comes to movie premieres and after show parties, remember that if you do get tickets, it's likely to be midweek, you'll need to arrive early and you should be prepared for a long night. Your best behaviour and dress will be required before you have any chance of getting into the after show party, so keep this in mind throughout the premiere. Be prepared to be photographed and to give your thoughts on the movie, and don't annoy the stars if they're in attendance. Everyone has the chance of getting movie premiere tickets, but after show parties are much more difficult. Private Car Park: Can I Be Fined for Parking Over a White Line?